My art reflects a lifelong interest in memory and thought, and the way we interpret our experiences over time. I draw on memories of landscapes around the world to create sense impressions of space and light. My invented landscapes feature the repeated use of stylised forms such as leaves, trees and blades of grass, the one sometimes morphing into the other. 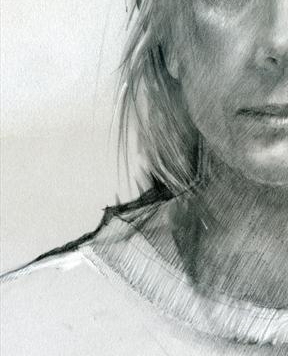 In my sketchbooks, on the other hand, I attempt to capture unposed moments in everyday life. Drawing from observation helps to develop my working memory and my understanding of the world we live in. And as I draw I develop a richer appreciation for the stories we tell ourselves about our lives. Whether working from observation or imagination, I am fascinated by relative scale and the way the smallest shift in perspective can determine whether something looks tiny or tremendous. These ideas were the basis for two of my solo exhibitions. First was The Portable River, or "Undercurrents - Ten Views through a River of Words", in 2007 at the River & Rowing Museum in Henley-on-Thames. Second in the series was "The Portable Forest" at Ripley Arts Centre in Bromley, Kent in 2012. Undercurrents is about creative self expression, and what a story feels like when you can't find the words to tell it. The Portable Forest is about thought and memories, and the way they come to us in moments of stillness. I think of quiet reflection as a habitat in which certain species of thought thrive. The images in The Portable Forest derive from Windsor Great Park and from my experience living in Germany: I was once deep in a forest where the only sound was a cuckoo calling in the distance, and the only visible creature was the occasional surprised deer. The magic of that memory has stayed with me, and I retreat to that world from time to time. Cynthia grew up in the North American prairies and worked internationally in large scale land planning before she returned to England and committed to a career in fine art. She works from her home-based studio in Windsor. An Urban Sketcher, Cynthia has a BFA degree in painting and further degrees in environmental planning and design. Her art can be seen in group exhibitions in London, and in solo and group exhibitions in and around the Thames Valley. From 2011 until 2014 Cynthia served on the Council of the Society of Graphic Fine Art - The Drawing Society, where she was responsible for digital media and edited the Society's blog, The Journal. She also served as Vice President of the Society from 2013 until 2014. Cynthia's art is in private collections in Britain, Singapore, the Czech Republic, the Netherlands and the USA. She is happy to discuss commissions for work large or small. Her work can be seen in her studio by prior arrangement. Publications: Author/illustrator of the pen and ink chapter in Artist's Drawing Techniques published by DK (Dorling Kindersley, August 2017). Four double-pages in Pen and Ink - Contemporary Artists, Timeless Techniques (pub. Frances Lincoln, 2016) by James Hobbs, freelance editor, author and artist based in London. Feature article 'Drawing at the Speed of Life' in Drawing magazine's special summer issue 'All about Sketchbooks' (F+W, New York, 2016). Cover art for Landscape Architecture Theory - An Ecological Approach by Michael D Murphy (pub. Island Press, 2016). Cover art for Notes Relating to an Idea of Blue, a poetry collection by David HW Grubb (pub. Shearsman, 2011). Awards: Highly Commended Work in Colour, and Highly Commended Work on the Exhibition Theme in DRAW 13, the 92nd Annual Open Exhibition of the Society of Graphic Fine Art - The Drawing Society. Group exhibitions in London: Tower 42 lobby, Bankside Gallery, Menier Gallery, Barbican Library, R K Burt Gallery, Southwark Cathedral Refectory Gallery. Group exhibitions outside London: The Old Fire Station, Henley-on-Thames; Oxfordshire Artweeks; Harvey Gallery, Guildford. Solo exhibitions: The River & Rowing Museum, Henley-on-Thames; The West Wing, Slough; Ripley Arts Centre, Bromley, Kent.